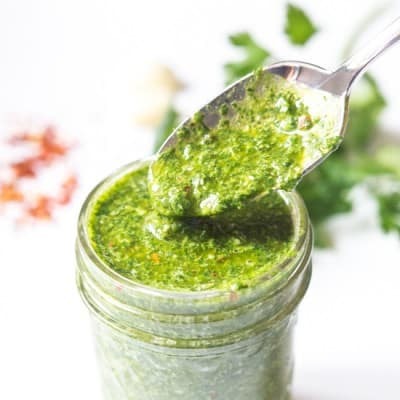 Paleo and Whole30 Herby Green Dressing – a light and refreshing dressing made with parsley, mint, basil and cilantro. 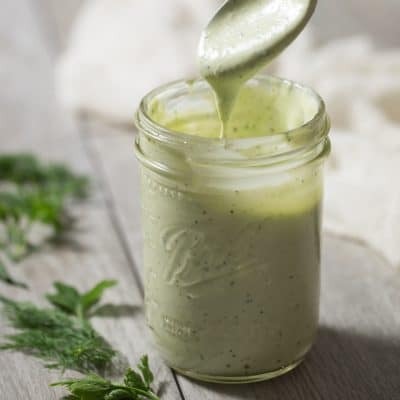 A healthier Green Goddess Dressing that is delicious on salads, meat and vegetables! Gluten free, dairy free, sugar free, clean eating. 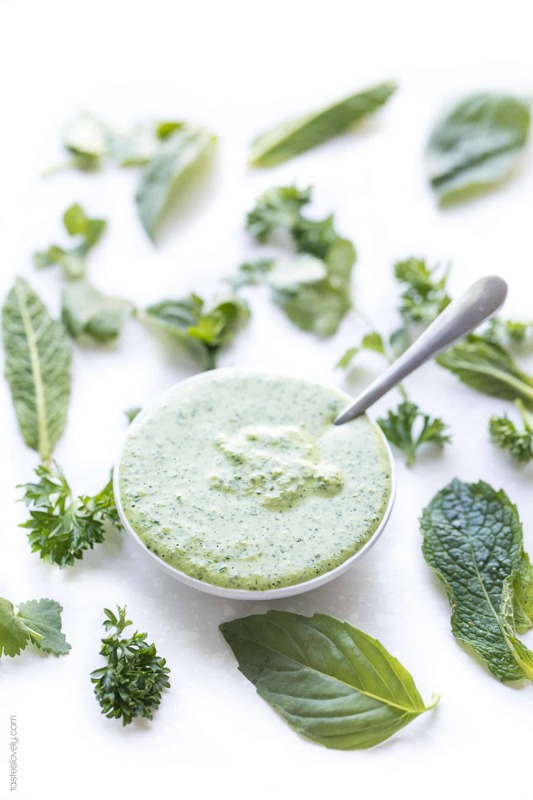 This herby green dressing is SO DELICIOUS it is getting it’s very own post. I am obsessed with it. I have been putting it on everything! Salads? It’s my new dressing. Grilled chicken? This is my new dipping sauce. Roasted vegetables? Getting a drizzle of this green dressing. There is nothing it doesn’t make better. It is light, bright and refreshing. Packed with so many delicious green herbs. 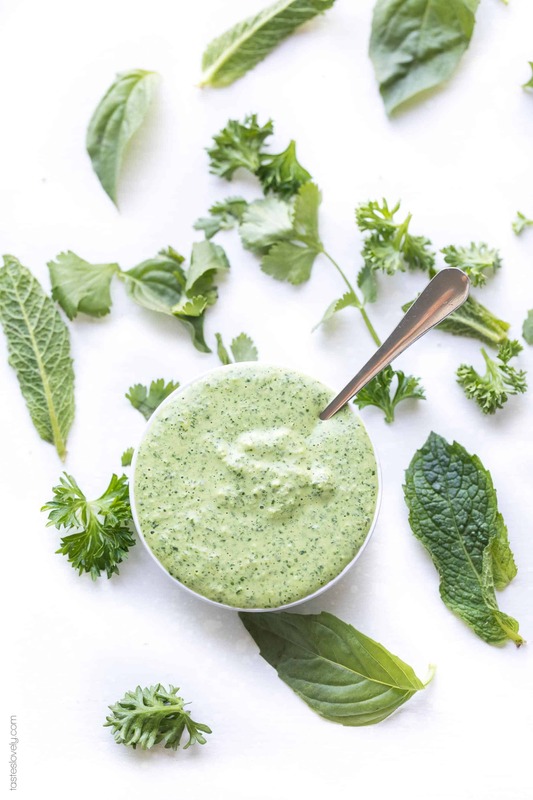 It is similar to a green goddess dressing, but even better. Plus, a whole lot healthier since it is dairy free, paleo, Whole30. I am especially loving it for spring now that the sun is out and the days are longer and I love enjoying fresh, light lunches and dinners. Did I mention it only takes 5 minutes to make in my food processor? I’m obsessed! 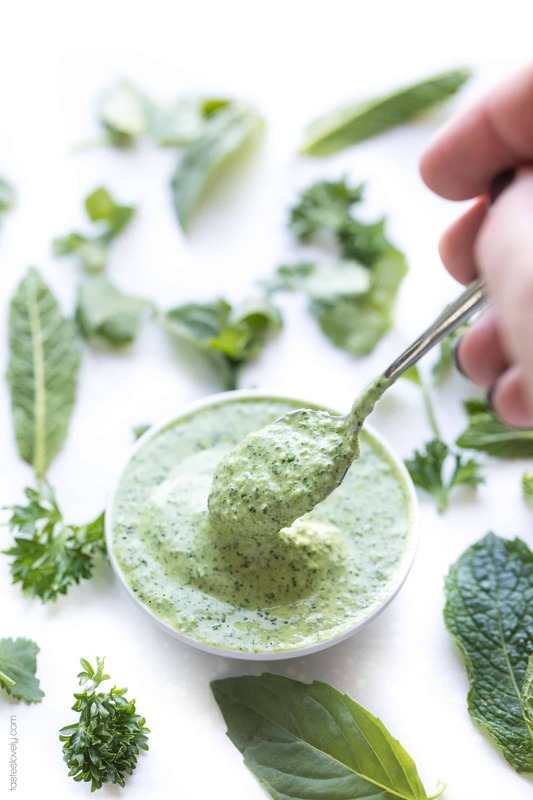 This herby green dressing is made using 5 different herbs: basil, mint, cilantro and parsley. There are some cashews to thicken it, add some nuttiness and a tiny bit of crunchy bits. There’s lemon juice for brightness. There is mayonnaise and almond milk for creaminess. And of course garlic, salt and pepper. 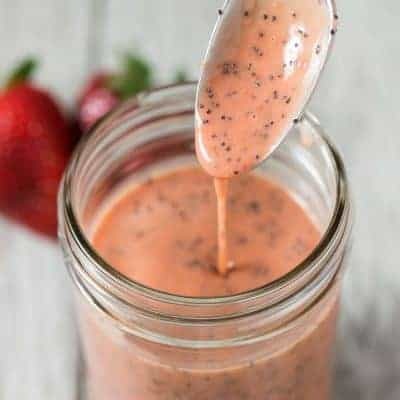 Throw it all in the food processor, blend away, and your new favorite dressing is ready to enjoy! It is delicious on just about everything. Of course you can use it as a salad dressing, but I’ve also been using it as a chicken marinade, topping for my lettuce wraps (new recipe coming soon! ), drizzled on roasted vegetables and potatoes, as a dip for blanched vegetables. I really can’t get enough. And I can enjoy it guilt free because it is so healthy! Paleo, whole30, gluten free, grain free, dairy free, sugar free, clean eating. 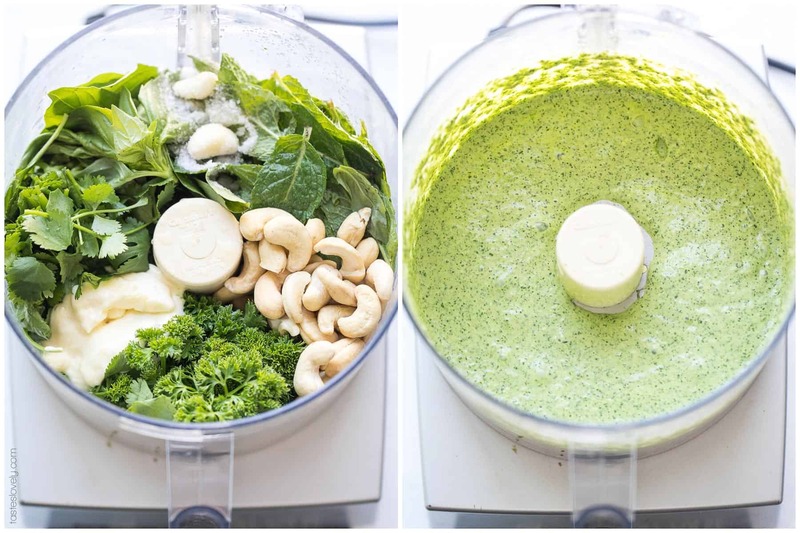 Combine all ingredients in a food processor, and blend until combined. Store in a pint size mason jar. Will keep in the refrigerator for 2 weeks. Use as a salad dressing, marinade for meat or seafood, on top of roasted veggies, as a dip for raw veggies, the possibilities are endless! this flavor of food is good for the people who are suffering gastric problem in the nights…. thanks for the information. 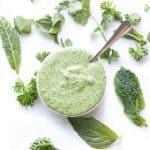 Can I use Nutribullet blender instead of food processor? Yes! A nutribullet works too!